The second Sunfish (SSN-649) was laid down on 15 January 1965 by the General Dynamics Corp. Quincy Mass. ; launched on 14 October 1966; sponsored by Mrs. Robert C. Byrd and commissioned on 15 March 1969 Comdr. Richard L. Thompson in command. Sunfish spent the period from April to August undergoing shakedown and in various exercises such as torpedo firing sound trials control drills and casualty drills. A short dependents' cruise in late August was followed by post-shakedown availability at Groton Conn. The last two weeks of 1969 were devoted to a leave and recreation period for the crew. Early 1970 was spent in upkeep periods and several short cruises in preparation for an extended deployment. 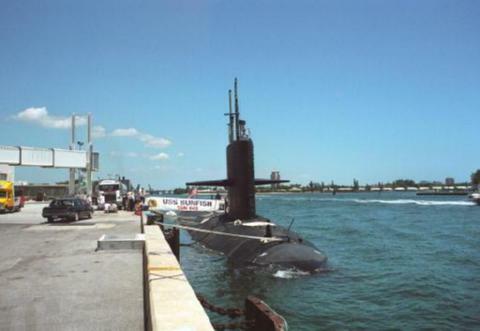 The submarine was deployed from 16 June to 26 August when she arrived at Charleston S.C. and again from 6 October to 1 December 1970. Sunfish put to sea on 22 January 1971 to participate in a short fleet exercise but operational commitments were changed and she did not return to port until 9 March. The ship made a cruise to Port Everglades Fla. in April which was followed by a fleet exercise. The remainder of the year was spent participating in antisubmarine warfare exercises with destroyers and patrol aircraft. Sunfish departed Charleston on 3 January 1972 for the Mediterranean and a tour of duty with the 6th Fleet. She returned to her home port on 21 May and entered a stand-down period that lasted until early October when she entered the Norfolk Naval Shipyard for her first major overhaul. The overhaul was completed in August 1973 and the submarine sailed to New London for refresher training. She touched at Charleston in early November and continued to the Caribbean for sound training and weapon systems tests. Sunfish returned to Charleston on 9 December 1973 for a leave and upkeep period. She operated along the east coast from New London to Cape Kennedy until June 1974. On 25 June Sunfish stood out of Charleston to begin a period of deployment. As of January 1975 Sunfish was still deployed as a unit of the United States Atlantic Fleet.